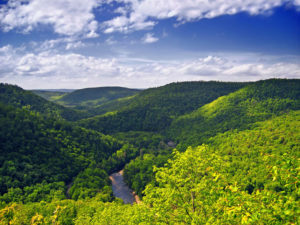 The 10 Best RV Trips To Take In Pennsylvania - Must See! Some people might know Pennsylvania for its cheese steaks and its vibrant cities. Others might know it for its rolling farmlands and rural towns. The truth is, Pennsylvania is the best of both worlds. Split down the middle by the Appalachian Mountains, it seems as if two entirely separate ways of life exist on either side – and that’s what makes the Keystone State so special. Pennsylvania is one of the larger states of the thirteen original colonies. Its past is of great importance, both historically and culturally. It’s here that the largest, most famous battle of the civil war took place. It’s also here that the Declaration of Independence and the Constitution were drafted and signed. Pennsylvania became a symbol of freedom; a cradle for the American way. Even the way Pennsylvanians work is a representation of America – the state is an economic giant with an economy that’s comparable to that of entire countries. But Pennsylvania isn’t all smokestacks and paperwork. The Keystone State also has a robust cultural and natural history. Its bustling cities stand in contrast to the simpler farm life of the state’s Amish population in the best way possible. Head in one direction and concrete jungles give way to meadows of golden wheat or orchards of apple trees. Go in another, and you might find yourself lost in a seemingly endless mountain forest. Though driving an RV rental through Pennsylvania may only take half a day, its juxtaposed landscapes will have you feeling like you’ve traveled through several worlds. It wasn’t easy, but we’ve managed to round up a list of the best destinations in Pennsylvania. 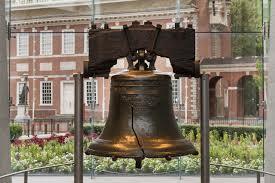 The Liberty Bell is pretty much a requirement on any road trip list about Pennsylvania, because America. For this one, head to Independence Park in the heart of Philadelphia. What’s to do here, you ask? There’s a lot more than just the Liberty Bell. You can take a tour of Independence Hall, where you can see the inkstand used to sign the Declaration of Independence, read the original draft of the Constitution, and visit the very courtroom where America’s best government-ing went down. The Benjamin Franklin Museum is here, too, and it promises fun for the whole family. Kids will love playing with the interactive exhibits as they learn about Ben’s work. He was a highly intelligent and complex guy, and the rooms within the museum reflect that perfectly. From personal artifacts to a print shop and exciting science experiments, visitors will get to know Ben as the beautiful mind that he was. Oh, and don’t forget to grab a Philly cheese steak while you’re in town. Price: Most sites are free! RV Parking & Campus Park and Ride is the only campground inside the city. Technically, it’s more RV parking than campground, but reviewers have stayed there for several nights on end without complaint. They offer clean and safe parking within their gated facility starting at $30 per night. Amenities include water and electric hookups, Wifi, showers, and a free shuttle to city attractions. Frank Lloyd Wright’s Fallingwater is another Pennsylvania must. Built in 1935 as a private home, Fallingwater is a feat of architectural design, even today. Wright’s goal was to create a home that melded with the environment, and boy, did he get it right on the nose. 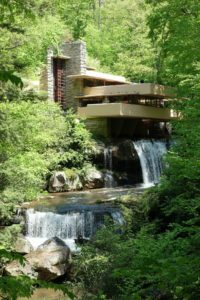 Fallingwater sits cantilevered atop a powerful waterfall, but despite its prominent location, one might not even notice the structure without knowing it was there. From the natural stone façade to the horizontal terraces that mimic the stepped rock surrounding them – it looks less like someone built the home and more like it grew from the earth organically. Since its opening to the public in the 1960’s, Fallingrock has seen nearly 70 million visitors. Trust us; you should join the list. Aside from touring this breathtaking modern marvel, there’s also a handful of educational programs, a café serving delicious farm-fresh cuisine, and special events throughout the year. Plus, the surrounding woodlands offer exceptional hiking and opportunities for wildlife observation. Price: Ticket prices vary based on tour type. See site for details. There’s a Jellystone Park just a few minutes up the road from Fallingwater. As with all Jellystone Parks, they offer a wealth of amenities and activities for the family, including a restaurant, store, a small waterpark, a pool, and much, much more. Rates start at $36 for a standard site with full hookups outside of peak season. If you have kids, please, take them to Hersheypark. Heck, you should go even if you don’t! In case you don’t know, it’s an award-winning park located in the foothills of the Laurel Mountains. The park got its humble beginnings in the 1920’s with just one roller coaster. Today, it has more than 70 rides and attractions, including a zoo and the neighboring Hershey’s Chocolate World. 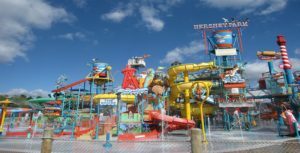 In 2018, Hersheypark will open a massive waterpark section with more than 40,000 gallons of water. Rides will include a water coaster and the longest mat racing course in the world. When you’re ready to dry off and relax, check out the summer concert series, which features a bevy of new artists each year. Or, you spend an hour strolling through the 11-acre, walk-through zoo. Make sure you plan to spend a day or two here if you want to experience everything Hersheypark has to offer. Price: Prices vary widely based on ticket packages, season, and other criteria. Hersheypark has its very own campground that’s convenient to the park itself. You’ll enjoy amenities like swimming pools and a game room, outdoor sports courts, movie nights, a country store, and more. RV sites include full and partial hookups with cable, Wifi, and a picnic table and fire ring. Rates start at $49 per night. Check out our list of the best RV parks in Pennsylvania for more high-end campgrounds in the area. You’ll love this next stop if you’re a fan of ghost towns, since Centralia is one of the creepiest of all. Technically, Centralia is a semi-ghost town – there’s still roughly 10 people living there, but the story of how it came to be that way is what makes it so spooky. Centralia began as a mining village. Underneath its streets runs a vast anthracite coal field, one of the purest and rarest types of coal in the world. In the 18th and early 19th centuries, the town prospered thanks to its mines. In 1962, a few years after most of the mines shut down, a small fire began burning below ground. Repeated attempts to extinguish and barricade the fire failed, and it continued to burn along the coal seam underlying the town. Eventually, the town was condemned, and residents were forced to leave. The majority of the homes were demolished, and the town’s zip code was discontinued. Centralia was officially wiped off the map. Today, the only remaining evidence of it are its few residents, and the underground mine fire that’s been burning for more than 50 years. Bring your camera, because you’ll find plenty of photo opportunities (and Silent Hill vibes) as you explore this eerie place. Address: The easiest way to get there is to take I-81 toward Rt. 61 and the nearby town of Ashland. Website: No website, but Uncovering PA has an excellent article on the town. Camp-a-While campground is about a half hour south of Centralia, just off I-81. It’s a quaint and quiet little campground with some nice amenities like a store, game room and arcade, pool, and a stocked fishing pond. Rates start at $36 per night. Ready to brush off that spooky feeling and go someplace a little more uplifting? Longwood Gardens, nestled in the heart of Brandywine Creek Valley, is a public botanical garden that covers more than 1,000 acres. It already sounds magical, right? There are dozens of gardens across the property, encompassing a variety of seasons and climates. From the stately topiary garden to the whimsical Canopy Cathedral, Longwood has something for every plant enthusiast. They offer special events and showcases throughout the year, or you can just explore the grounds on your own. Price: Tickets vary by season and package. See site for details. The closest campground is the Philadelphia/West Chester KOA. KOA’s always have a nice mix of amenities, and this one is no different. Features include a pool, game room, camp store, gem mine and playground, and more. Rates vary; see site for details. 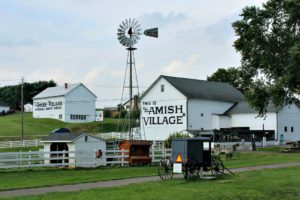 While you’re in the area, why not stop by the Amish village in the nearby town of Lancaster? Here, you can tour an authentic farmhouse and tour the village grounds while immersing yourself in the back-to-basics lifestyle. You can even pop in for a lesson in Amish at the local schoolhouse. Just north of the village is another hotspot: Lititz. It was named as “America’s Coolest Small Town” in 2013, and it certainly lives up to its reputation. Oodles of quaint downtown shops offer everything from boutique clothing to Moravian antiques. Don’t forget to take a tour and sample some treats from the Julius Sturgis Pretzel Bakery – the first commercial pretzel bakery in the United States. Price: Rates vary based on tour package. Circle M RV & Camping Resort is a few minutes south of Lancaster, making it a convenient home base for exploring Lancaster County. It’s a western-themed resort with an array of amenities like a swimming pool, outdoor sports courts, waterfront sites, a library, planned activities, and more. Rates average $65 per night. If you’d like something more affordable, check out this list of RV parking in Pennsylvania. Though it may be on the smaller side acreage-wise, World’s End makes up for it with its sprawling natural beauty. The park is located in the Loyalsock Creek Valley, surrounded by the lush greenery of the Loyalsock State Forest. Vantage points throughout the park offer panoramic views of the forest stretching out to the horizon and beyond. It’s no wonder they call this area the Endless Mountains region. The park is also known for its variety of outdoor recreation, like fishing, whitewater kayaking, hiking, and more. World’s End State Park offers overnight sites and cabin rentals. According to reviews, the RV sites offer electric hookups, and there is a dumping station on the premises. Facilities include clean restrooms, showers, and a small snack shop. Unfortunately, the parking might be tough for RVs larger than 35 feet or so. Rates start at $28 per night. In the early 1900s, Henry Chapman Mercer had a vision. He wanted to create a castle, not just as his home, but as a place to display the prints and tiles he’d collected over the years. A renowned archaeologist and anthropologist, Mercer included a wide range of styles as he built his castle by hand. Visitors can see the inspiration from Medieval and Gothic architecture throughout the concrete castle. 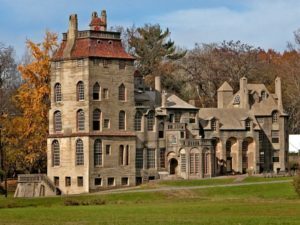 Both the castle and the nearby museum offer an eclectic mix of exhibits covering a range of Pre-Industrial American objects. Price: Admission to both the castle and museum is $26 for adults, $15 for kids ages 6-17, and free for kids 5 and under. Little Red Barn Campground is a decent-sized campground just north of Fonthill Castle in Quakertown. Most of their sites offer water and electric hookups, along with free Wi-fi. Amenities include a pool, game room, playground, and volleyball and basketball courts. Rates start at $40 for 30-amp hookups outside of peak season. Presque Isle is a peninsula of Lake Erie. It’s the one and only place you’ll find a sandy coastline in the state. There are 13 sandy beaches along this 3,200-acre park, offering ample opportunity to spread out and claim a little sliver of sand for yourself. Venture off to explore the lagoons or snap a few photos in front of the lighthouse. 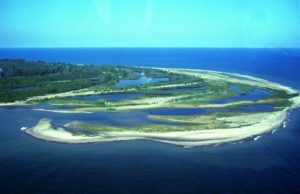 The Tom Ridge Environmental Center, which sits at the entrance to the park, encourages visitors to learn about the park’s ecological history and importance. Wildlife observation is also a favored activity at the park, as there are nearly 340 species of birds across the park’s six geological zones. There are campgrounds on either end of the park: Sara’s Campground to the south and Lampe Campground to the north. Lampe campground offers waterfront sites starting at $32 per night. Sara’s Campground doesn’t have waterfront RV sites, but they do offer a wealth of amenities like an onsite restaurant, general store, and souvenir shop. Both campgrounds are convenient to downtown Erie’s attractions and RV dealers in Pennsylvania. Big Pocono State Park is – as you’ve probably guessed – located high in the Pocono Mountains. 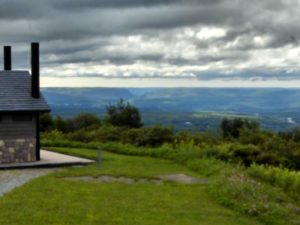 From its perch at the summit of Camelback Mountain, Big Pocono State Park offers stunning scenery as far as the eye can see. There’s a short scenic drive around the park which affords sweeping views of Pennsylvania, New York, and New Jersey. Cameltop Mountain Lodge is near the summit as well, and serves as a nice spot to grab lunch before heading back out on your journey. Winter sports, hiking, wildlife observation, and horseback riding are all popular activities in the area. Scotrun RV resort is convenient to area attractions like the Camelback Ski Mountain, Camelbeach Mountain Waterpark, and more. It’s an Encore resort, so you know they offer a long list of family-friendly amenities. Some of these include a pool, waterfront sites, mini golf, a camp store, a billiard room, a playground, and more. Rates vary, so check the site for details. Exploring Pennsylvania is like flipping a coin where both sides lead to adventure. On one side, you have the modern-day attractions of its cities and towns, on the other, the boundless natural beauty that’s begging to be explored. And, no matter where you choose to go, you’ll find that most of the state is steeped in culture and history, making it an ideal place for travelers of all types. The Keystone State has a diverse array of opportunities, meaning you won’t have to look far to find an activity for everyone in your family.